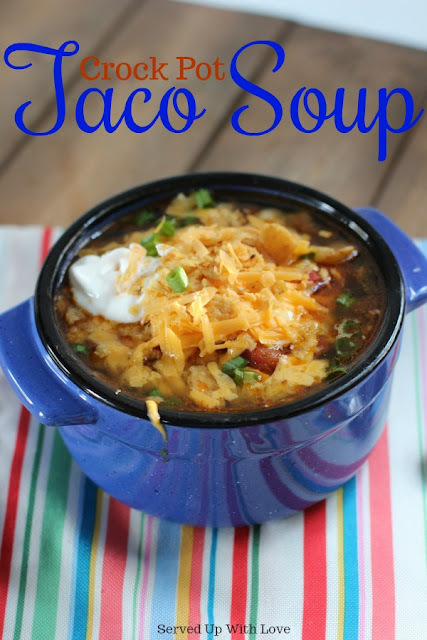 Cheesy.....Taco.....Soup....need I say more! My family absolutely loves anything that is considered "taco." When I was pregnant with my daughter, I craved any kind of Mexican food. I know this is bad but I visited Taco Bell quite often on my lunch break back then. Thinking back on it now I am surprised I did not get sick of it. It is no wonder that tacos are one of my daughters favorite things to eat. So you can imagine I try a lot of taco inspired dishes. 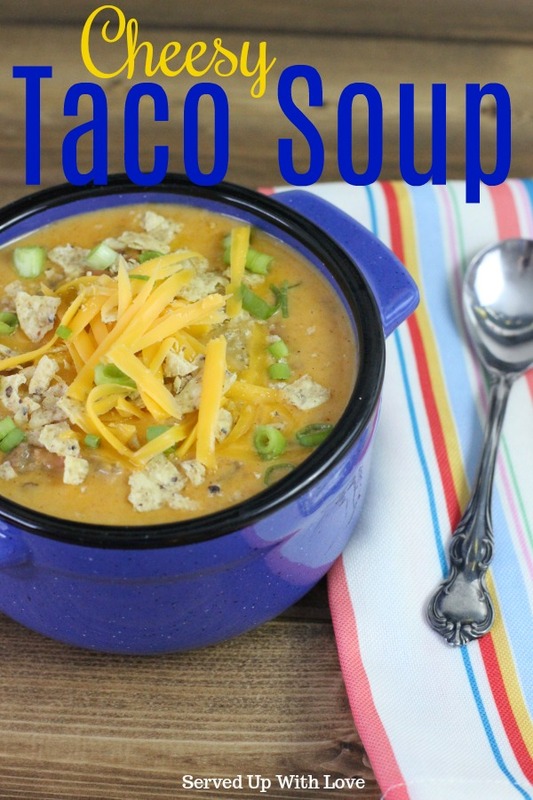 I have made taco soup before and although I enjoyed it my kids didn't really care for it. I have to admit my son and I actually fought over the last little bowl. So good and so hearty. 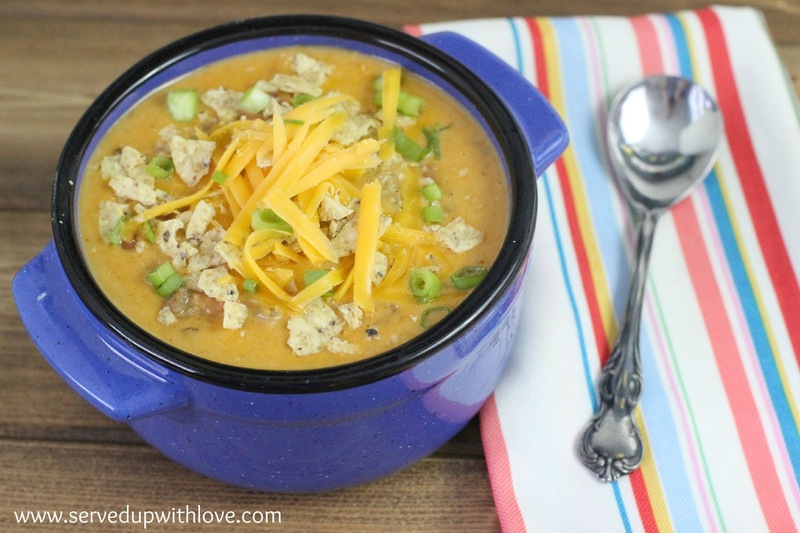 This soup is one of my favorites! Taco soup like you have never had it before. Cheesy, meaty, beefy, and of so good and hearty. Brown ground beef in a large soup pot over medium-high heat, seasoning with salt and pepper, until no longer pink. Drain and return to pot. Meanwhile, in a separate pan, melt butter over medium heat then whisk in flour and cook for one minute. Slowly whisk in 1 cup milk, season with salt and pepper and stir mixture until thickened. Remove from heat, stir in cheese until smooth. Set aside. Add taco seasoning, rotel, beans, cheese sauce, and remaining 1-1/2 cups milk into cooked ground beef then stir well to combine. Bring to a heavy simmer then turn heat down to medium and simmer for 10 minutes, stirring occasionally. Serve with crushed tortilla chips and more shredded cheese, if desired. Add black beans or substitute the pinto beans with any bean you prefer. 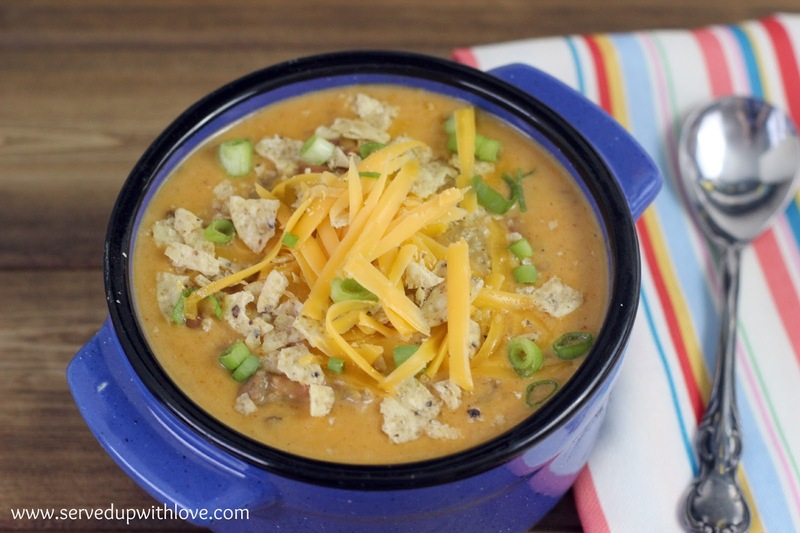 I know my boys will love this wonderful soup! Thank you for sharing on Thursday's Treasures! I've shared it on my 100th Week Celebration! Please stop by to share and enter the giveaway. <3 and hugs sweet friend! So funny. I craved Mexican food when I was pregnant, too. This soup looks yummy! This soup is super good and comforting, thanks ladies for stopping by! 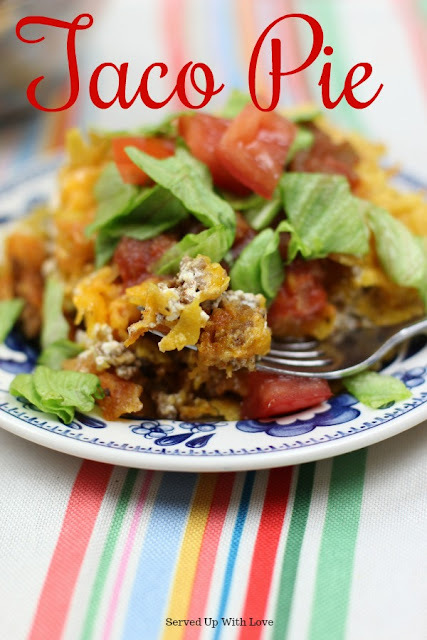 Hey, I am making this tonight for supper, double batch. Do you feel the rotel and taco seasoning makes this a spicy soup? Thinking about doubling everything except taco seasoning. I would love to hear your thoughts!!!! Hi, I always double now, I double both of those but it is totally up to you. I use mild rotel. If using for little ones maybe just one packet of taco seasoning would be a little less spicy. Let me know how it turns out for you, its a favorite here! G'day! HOW warm and comforting, true! Sounds so yummy!! Think there is any way I could do this in the slow cooker? I have not tried this in the crock pot but I have intentions to do so because I love using my crock pot. I think it will work, if you try it please let us know how it turned out for you. I have put this link on every social network I have. This is the best soup EVER! "If I had to chose one soup to have for the rest of my life, it would be this one!" I've told friends, coworkers, the mailman, the dog, the homeless guy on the corner, anyone who will listen... Wonderful! Thanks Kathryn, We love it and I hope your family does as well! You definitely don't need to say more! Wowzers that looks good and perfect for the cold weather that's popping back up!Thanks for linking up with delicious dishes recipe party! Thanks so much ladies! This soups is to-die-for good! My family loved this soup! It is very easy to put together. I will be making it again. Thank you. This is one of our favorite recipes and I almost always have to make a double or triple batch. So glad it was a hit for your family. Oh yes! Or should I say SI? =D I must try this soon...sounds so good. Mexican dishes are always my favorite. Marsha, this one is so good I have to double and sometimes triple it to make sure it stretches far enough. It is soo soo good! You have to try it! Co you drain the beans?